Lessons from the Berry Patch: Lesson 1 ~ Wild Blackberries are Free for the Picking | Redeemed! Wild blackberries are free for the picking! Blackberries grow wild, in Arkansas, and throughout most of the South. They grow anywhere they can get plenty of sunshine and water, and haven’t been regularly mown down. Wild berries don’t require planting or tending. They don’t require pruning, watering, fertilizing, mulching, hoeing, or weeding. Wild blackberries are simply “brought forth” from the earth, as nature’s bounty, of tasty, refreshing, sweet, juicy berries. You can take any open field in Arkansas, stop mowing it or tending it, and within two years, wild blackberries will be growing in any low spots where water collects, and where there is plenty of direct sunlight. They just grow, whether you want them to or not, unless you are putting specific effort into keeping them from growing. Wild blackberries don’t have to be bought or paid for. Yes, some farmers charge people to pick berries on their farms. However, generally speaking, anyone who lives in rural Arkansas, and likes to pick blackberries, knows where they can find plenty of wild berries free of charge. You just have to be willing to look. Wild blackberries are simply God’s free gift to us, a juicy, sweet, delicious gift he makes available to anyone who wants them, with no charge, and no need to plant, water or tend. They are a completely free gift, already made available, with no strings attached, and nothing you can do to earn them or pay for them! Harvesting wild blackberries requires a lot of dedication and hard work! Yes, they are free for the picking, but the picking includes many trials. If you want wild blackberries, you must be prepared to invest a lot of time, effort, and inconvenience harvesting them. Blackberries like to grow in areas with lots of direct sunlight. So, you will be exposed to the sun the whole time you are harvesting them. They ripen during June and July, two of the hottest months in Arkansas. It is hot, sweaty work, with lots of potential for sunburn or dehydration. Blackberries are defended by thorns. No matter how hard you try, it is impossible to harvest wild blackberries without acquiring a substantial number of pricks and scratches. Then, your sweat from the heat runs into the scratches, making them burn with salt. By the end of a day of picking, your hands and forearms will be a mass of pricks and scratches stained dark by blood and berry juice, and caked with salt from your sweat. 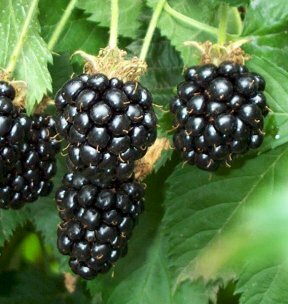 The places that blackberries like to grow are the same places that are likely to be inhabited by parasitic blood-sucking insects, such as ticks, chiggers, horse-flies, and mosquitoes. It is best to protect yourself with insect repellant, but you will still end up with some itchy insect bites, by the end of the day. Of course the insect repellant washes with your sweat and sunblock, into your eyes, making them burn, and into those scratches on your hands and forearms, making them sting. And, because blackberries like lots of water, they tend to grow in marshy spots that hold moisture. So, there is a reasonably good chance your shoes will get so soaked and muddy that they will squish as you walk. And, of course, between the berries and the water, you have to keep a sharp eye out for snakes and other critters. Picking wild blackberries is not for the faint of heart. It is a project that requires commitment and dedication. Many people will start out for the berry patch, thinking it sounds like fun, just to tire of the effort within the first 15 minutes, and head back to the cool comfort of an air-conditioned living room, with little to show for their effort, beyond a need for a good shower and change of clothes. Before you start out to the berry patch, you need to count the cost. You need to know what you’re likely to be facing and make sure you are prepared for the trials likely to be encountered. You won’t get a bucketful of berries in a casual 15 minute walk-by. You’ve got to be ready to get hot, tired, sweaty, sun-burned, bug-bitten, and thorn-pricked, if you want a good day’s berry harvest. Many things in life that are freely given still require a lot of work before we can benefit from them. Consider a full academic college scholarship, for example. It is a free gift! Yes, the student probably had to keep their grades up in high school and do well on the college entrance exam, in order to qualify. Still, though, nobody owes the student that money. It is made available to them as a free gift that they can either accept or not accept. However, if they choose to accept the scholarship, it is just the start of all the hard work required to make full use of the gift. The scholarship covers the monetary cost of the education. However, in order to appropriate that gift of an education, in order to own it and make it theirs, they must commit to regularly attending class, to listening to lectures and taking notes, to reading assignments, to doing their homework, to studying hard for tests, to completing projects, and to asking questions when they don’t understand. Without all the hard work of actually partaking of the education and making it a part of themselves, the free gift of the scholarship is of absolutely no benefit to the student, whatsoever. The scholarship is a completely free gift providing an educational opportunity that otherwise would not exist. Appropriation of that free gift and actually gaining benefit from it requires a lot of hard work and discipline. Like the wild blackberries, God’s grace is made available to everyone, free of charge. It has already been made available to everyone, and there is absolutely nothing we can do to earn it or deserve it. It is already made available whether or not we choose to accept it, and is there for the accepting. “For by grace you have been saved, thru faith; and that not of yourselves, it is the gift of God; not as a result of works, so that no one may boast” (Ephesians 2:8-9). We tend to think that because it is a free gift that it requires no effort, but this is not the case. Yes, God’s grace is offered as a free gift. However, having chosen to accept the free gift, in order for us to benefit from it, for us to appropriate it and make it a part of ourselves, requires a good deal of hard work and discipline, “For we are His workmanship, created in Christ Jesus for good works, which God prepared beforehand so that we would walk in them” (Ephesians 2:10). The purpose of the free gift of God’s grace is to enable us to do “good works” we would not otherwise be capable of doing. Having now the ability to do good works, we gain the responsibility to carry them out, and good works are…well…work! Hard work! Jesus did not come so that we could keep living in the blindness and darkness of sin, while still hoping to escape Hell. Jesus came to transform us, from children of darkness to children of light! “…for you were formerly darkness, but now you are Light in the Lord; walk as children of Light” (Ephesians 5:8). Having begun his epistle to the Ephesians emphasizing that God’s grace is a free gift, not of works (Ephesians 2:8-9), Paul goes on to say, “For this you know with certainty, that no immoral or impure person or covetous man, who is an idolator, has an inheritance in the kingdom of Christ and God. Let no one deceive you with empty words, for because of these things the wrath of God comes upon the sons of disobedience. Therefore do not be partakers with them; for you were formerly darkness, but now you are light in the Lord; walk as children of light (for the fruit of the light consists in all goodness and righteousness and truth), trying to learn what is pleasing to the Lord” (Ephesians 5:5-10). Sounds like a lot of hard work, doesn’t it? Harder, even, than picking wild blackberries on a hot summer day…or studying for an exam! It sounds like hard work, because it is hard work. God’s goal, in our salvation, is for our very natures to be changed, from desiring and pursuing self-serving sinful desires to desiring and pursuing righteousness, godliness and holiness. God does not force that new nature on us; He never violates our free will. Rather, he teaches and guides us in the paths of righteousness, as we are daily transformed into His image. That requires a lot of hard work on our part…but would be completely impossible without the transforming presence of the Holy Spirit dwelling in our hearts. Without the Holy Spirit, we would not even desire to be transformed, but would be content to remain in the blind darkness of our sin nature. The free gift of God’s grace is not to keep us from having to work. Rather it is to instill in us a desire to work and to enable us to work effectively. With the free gift of God’s grace, we can be transformed into the image of Christ, something which would have been completely impossible apart from that grace. So, accept the free gift of God’s grace, so that you can effectively begin the hard work of appropriating (harvesting) the truth of His word, so you can partake (eat) of His goodness, making it a part of your nature! It is time to start picking! Are we, Christ’s church, sometimes guilty of misrepresenting God’s grace in how we present the gospel? Do we either over-emphasize works or over-emphasize grace to the exclusion of the other? How can we better present the gospel to give a clearer undertsanding of these points? Note: The idea for this series of lessons was conceived several years ago, while picking blackberries one hot summer day, with my sister Melody, on her farm in Bee Branch, Arkansas. Thank you, Melody, for the memories, the visiting, and the thought-provoking discussions! This entry was posted in Lessons from the Berry Patch and tagged berry, blackberries, christian, god, gospel, grace, living, patch, work by joe. Bookmark the permalink.